VWO provides you with a feature to record the observations that you make while analyzing your website. The Observations dashboard is where you create and manage all your observations. To access the Observations dashboard, on the navigation bar, click Observations under Plan. The Observations screen that appears lists down all the Observations created by you. To create Observation, click the Create button in the upper right-hand corner of the Observations dashboard. To learn more on setting up an Observation, click here. Updated: Sort by date of last update. 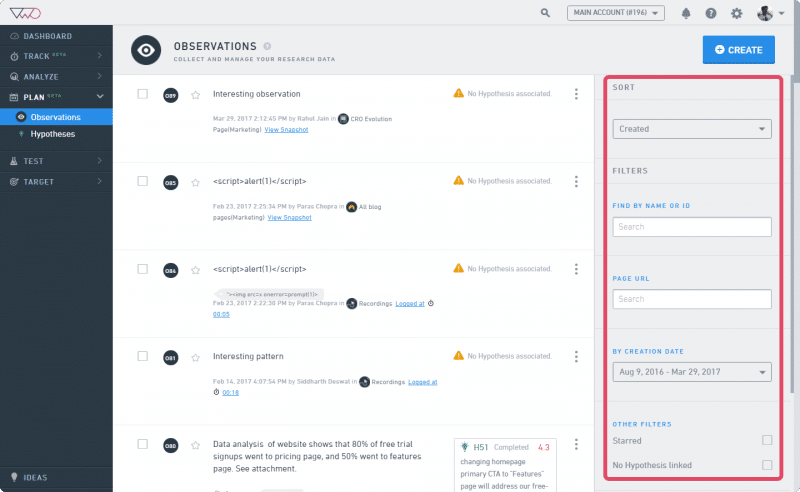 From the Observations dashboard, you can also link your observations with the hypotheses that you feel can improve conversions. To know how to link observations to hypotheses, click here. Click the ellipses and select Edit or Delete to make the changes. You can also delete an observation by selecting it and clicking Delete on the toolbar. To add an Observation to your favorites, star it.